How many Gods are there in this world? The essence of all scriptures and paths of Hinduism (Santhana Dharma) is to realise our Self (Atma). The Vedas (Hindu Holy scripts and edicts) are very ancient – so much so that any amounts of research and studies can only push the dates (periods) of its origins only to earlier periods than before, unable to unanimously establish the correct dates. Even those who don’t follow the Vedas agree to the fact about this ageless nature of Vedas. Vedas are nothing but the essence of The Lord. There is no hen without the egg and viceversa – it is just that we need to agree that none of this is possible without The Lord’s creation. There cannot be many Gods in this world. Each country or city cannot have its own individual God. So is it that each race or community cannot have its own God. Are worship methods for The God just for show and pomp? There is but one God for all in all countries, cities, races, religions. Since that Lord is all-powerful and omni-present, it is just possible for all of us to worship in any form, with any name and we (and our prayers) can still reach Him. There are some who debate that Bhakthi, respect and reverence need not be shown outwardly to Gods as these are just attributes that are to be reflected in our minds and not for outward show. Such people say that practices such as applying tilak, wearing japa mala, prostrating to The Lord , performing Puja, service to Lord and Holy men (sadhus), are unnecessary habits. They even make fun questioning if only performing these acts can count as Bhakthi. But in their day-to-day life, their children wear uniform to schools – they don’t question if children can study only with appropriate uniforms. The same people who debate like this, just jump out of their seats at workplace in the presence of senior officials! Unlike their justification that respect and love just need to be present only at heart, they hug and make merry when friends arrive. When others don’t treat them well especially when visiting each other’s homes, then they get upset and fight with each other instead of standing by their principles that respect and reverence need to be maintained at heart only (and no need for expressing in actions). Those returning home from foreign and other trips buy truck loads of gifts for children and others, just so to express their affection. Do they stop and think that their love can be expressed only by gifting to others? Even more than this, they don’t expect others to be happy or merry when they are sick or unhappy. They just expect others to come and enquire about them, even without thinking if such acts may reduce their suffering. We just need other’s empathy in words and actions and some of us don’t like others to be even happy without doing their part (As per our expectation). From all this, we can understand that we always have been exhibiting our love, friendships, discipline, etiquette, joy and sorrow towards the world that we are living in. We also expect others to follow those things that we consider right. So in reality, we have been cheating ourselves by thinking that discipline, dedication, bhakthi and reverence in aspects of bhakthi just needs to be felt at heart and not needed to be translated in actions. Why do we need to give forms of statues, house them in temples and follow worship decorum for The Lord who is the most super power in the universe? That something, which does not need names and forms, has only appeared as thousand (and more) name forms just because of its mercy on all of us. The meaning of word ‘Rishi’ is given to one who has seen a mantra in form. Seeing a mantra as a form means seeing an associated God with that mantra. Just like how we think about a real cow or hen just by looking at corresponding toys, what the Maharishis (great Rishis) defined as forms of Gods as statue forms using their great spiritual powers, are the deities we worship in temples today. Even when solar power (Sun’s rays) is available at all places, when the same is focused via prisms, the recieved ray magnitude increases such that enormous heat and power is generated. Similarly the great Maharishis have had great love and responsibilities for future generations, and using their strong spiritual powers have had created deity forms that resonate with omni-prevading Grace of The Lord. Even if we are not able to recreate such great feats, we can ensure that the Grace in deities and temples are not diminished over time. Thus we can also live a better life. Even when we don’t give due respect and even look at the deities when visiting temples, is it not true that The Lord is seeing us? How can such respect, bhakthi and reverence shown for a stone or metal deity be considered as meant actually for The Lord? How can any indifferent attitude shown to these worship methods be considered as wrong to The Lord? Is it not possible to tag the creation dates for such deities even when The Lord cannot be measured with time? Are’nt they just made of stone/metal? What is the difference between a stone lying on roadside, one that belongs to a great mountain and one that is being worshipped in temples? And thus there are questions many! Sri Adi Shankarar, Sri Rama Krishna Paramahamsar, Sri Ramana Maharishigal were also humans – just like us. Can we even compare ourselves to them? Even when they were humans themselves, the human clan now worships them. The reason for this is the Godliness in them. Similarly there is a fire of Godliness in the deities being installed and worshipped in temples. This power can protect as well as destroy the world. We should revere and pray to these forces. In the society and politics, there are some in this world who offer garlands to pictures and cut-outs of their favorite society and political personalities; and still imagine they have offered something to the actual person. Even those people of fame consider such acts as something that has been performed to their own self. Any respect or disrespect shown towards national symbols is considered as performed towards the nation and patriotism is values upon such acts. Similar to this, bhakthi and respect shown towards deities in temples reaches The Lord and any disrespect done to deities is considered for The Lord Himself. So we must, in all possible ways undertake spiritual journeys (yatras) to holy places and temples and become recipients of His Grace. So why are there numerous ways and means of worshipping a single God in Hinduism, that too in different forms? There are some amongst also, who mock that there are numerous Gods within Sanathana Dharma (Hinduism). In everything, the deepest and correct truth has to be understood instead of just skimming through the context and making a partial/incorrect opinion and keep insisting about them. Renouncing the world, controlling their minds for years together, what the Rishis have discovered using their spiritual prowess should be correct on all accounts. Again it is wrong to just pass comments on such without even attempting to understand. 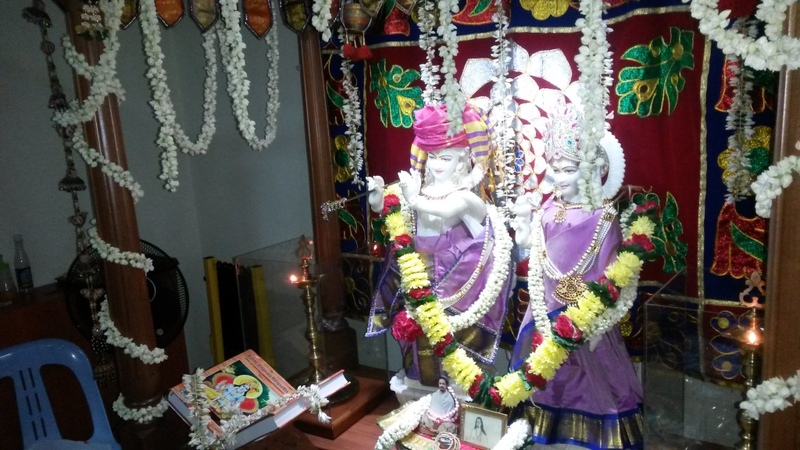 Click here for other flowers of Bhakti Garland - our Margazhi 2014 special!